Crab Nebula: A supernova remnant and pulsar in the constellation of Taurus. Caption: The explosion was seen on Earth in 1054 AD. At the center of the nebula is a rapidly spinning neutron star, or pulsar that emits pulses of radiation 30 times a second. 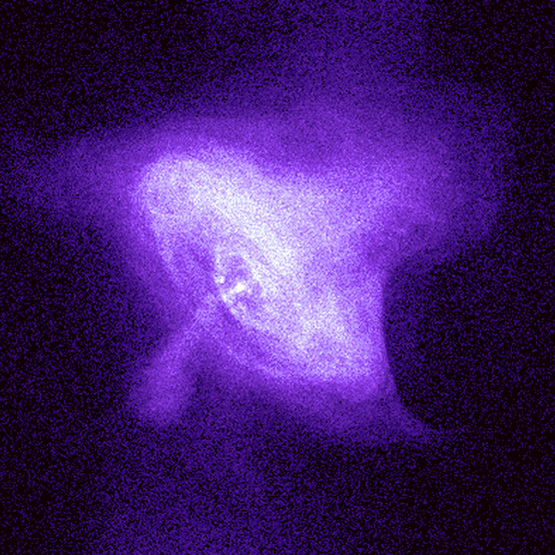 The image shows the central pulsar surrounded by tilted rings of high-energy particles that appear to have been flung outward over a distance of more than a light year from the pulsar. Perpendicular to the rings, jet-like structures produced by high-energy particles blast away from the pulsar. The diameter of the inner ring in the image is about one light year, more than 1000 times the diameter of our solar system. The X rays from the Crab nebula are produced by high-energy particles spiraling around magnetic field lines in the Nebula. The bell-shaped appearance of the Nebula could be due to the way this huge magnetized bubble was produced or to its interaction with clouds of gas and dust in the vicinity. Scale: Image is 2.5 arc minutes on a side.